Instagram has gone from one of the most “viral” social networks to a pay-to-play platform during the year. That was the conclusion reached by social analytics and reporting firm Locowise in its 2015 year in review. Locowise found that follower growth and engagement on the Facebook-owned photo- and video-sharing network declined throughout 2015, although the former remained stronger than Facebook or Twitter. Follower growth of 0.23 percent in December was down 88.21 percent from the 2015 high of 1.95 percent in April. However, Instagram still topped Facebook (0.14 percent) and Twitter (0.09 percent) in terms of December follower growth. Engagement rate also reached its peak in April, 2.8 percent, reaching its low point of 1.08 percent in December, a 61.43 percent drop. 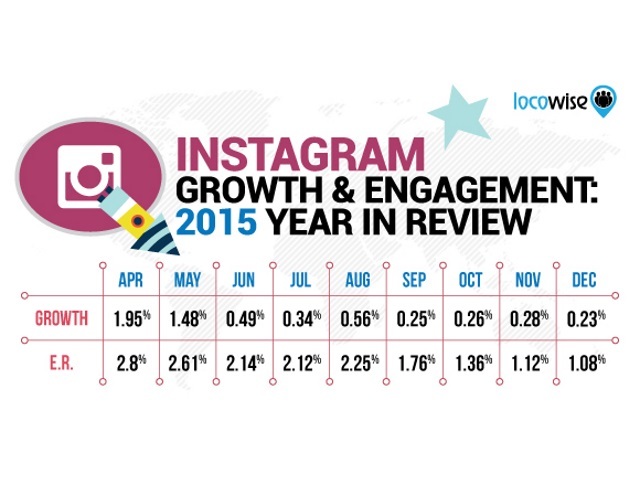 Again, Instagram outperformed Facebook (0.37 percent) and Twitter (0.1 percent) in December engagement. Instagram profiles posted an average of 2.74 times per day in December, with images representing 91.87 percent of those posts. Image posts engaged 1.1 percent of followers, while that number slipped to 0.83 percent for video posts. 97.4 percent of all engagements were likes. If you want to achieve great growth on Instagram, you do need to consider alternative tactics. Organic growth will not get you far. Readers: What are your thoughts on Locowise’s findings?